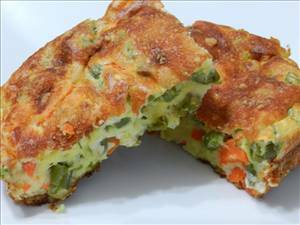 Very light and delicious, a tasty way to have your vegetables. Boil green beans and carrots until tender. Drain and slice into small pieces. Set aside. In the microwave heat milk for 2 minutes on high. Melt margarine in a large saucepan over medium heat, add onion and cook for 3 minutes. Add flour whisking a little at the time until it forms a consistent ball. Continue whisking and add milk (1/2 cup at a time), cook until it thickens. Add cooked vegetables, egg yolks and parmesan cheese to the mixture. Beat egg whites and add to the mixture. Add baking powder. Coat a 8x8 baking dish with cooking spray and pour in mixture, sprinkling a parmesan cheese on top. Bake for 20 minutes at 350° F (175° C) or until golden on top and toothpick comes out clean from the center. 62 members have added this recipe to their cookbook. Fresh kale salad with blueberries and nuts. Stir-fry dish with veggies and turkey sausage. There are 316 calories in 1 serving of Green Beans and Carrots Souffle. Calorie break-down: 45% fat, 30% carbs, 25% protein.